This tactical shoulder bag conveniently hangs by your side and keeps your gear separated and quickly accessible. You can create many different configurations for your gear depending on the outing or environment. Easily holds your emergency shelter, fire starting, signalling, first aid and lots of other gear you may choose to carry. 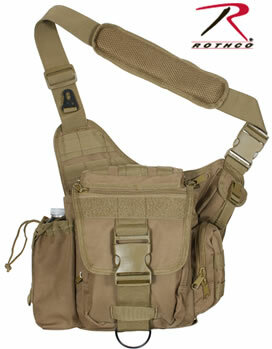 2" WIDE ADJUSTABLE, PADDED SHOULDER STRAP-QUICK RELEASE BUCKLE AND HOOK.